In the wake of the tragedy in Connecticut last week, I cannot turn off the Christmas music. It brings me peace, comfort and hope in this fallen world. I cannot bring myself to listen to news radio, watch TV broadcasts, read updates about the events of the massacre or look at pictures of those precious little faces. The few times I have chanced a glance, read a blog post or poem or heard 10 seconds of a news report I burst into tears. Why? Because I can only see the face of my own little Cupcake and it is just too much for this Mommy to handle. 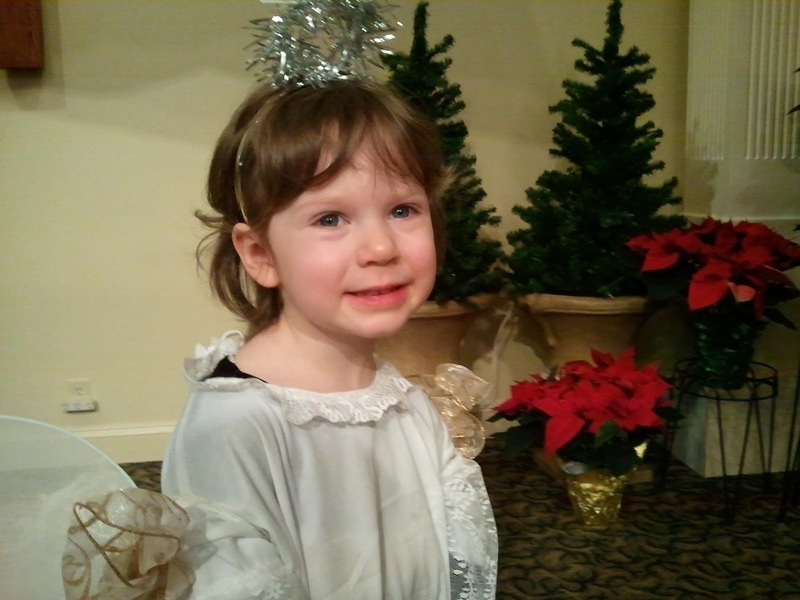 Cupcake in the Christmas program at church this weekend! I can only imagine the heart wrenching agony of those parents, pray for them and weep with them. Nowadays, the news constantly bombards my worrisome heart with potential danger, hazard, harm and tragedy that could befall my children at any moment. Yet, I am also aware that I am not the only mother, bleary-eyed and heavyhearted today, nor am I the first mother to feel this way. Every generation deals with tragedy. Some may be further from our doorstep than others - some may be on the other side of the world and others down the street at our local mall. I will never forget the day that our little community was rocked by a shooting at our teenage hangout - the mall. One young, disturbed, woman opened fire killing three and wounding seven on October 30, 1985 at the Springfield Mall in the Philadelphia suburbs. My mom and I were distraught because my father had gone to the mall. In the era before cell phones, it was an agonizing wait before we got word that he was safe. My Dad came home, but for those other families, their lives were changed that day. Just like the families whose children did not come home to them from Sandy Hook Elementary School on Friday. Today, when I dropped Cupcake off at her preschool, I was surprised by my own emotions. She skipped along beside me, blissfully unaware of the tragedy that had taken the lives of children only a few years older than her and shattered the lives of many parents. I fought back tears as I hugged her, kissed her and we shared "I love yous." I attempted to gain my composure as I forced myself to hit the grocery store, while she was at school. Anxiously I completed my shopping and rushed back to pick her up. I have never felt more relieved to see her smiling and waving to me as she ran and jumped into my arms for a big bear hug. Again, I fought the tears as I realized that those other mothers had been deprived of one more hug, kiss or "I love you" from their little ones. I hugged her even tighter. The world is a scary, broken place. But there is hope. With my teens I've had the opportunity to discuss the events of this and other tragedies. These are hard but meaningful times to talk to them about the world in which we live and the hope that we have, despite the circumstances we or others may face. Look around at the lights, the trees, the decorations and remember why we celebrate Christmas. The baby in the manger came to rescue us. He is our Hope, our Redeemer, our Savior. Without this hope, I would not be able to function. I would be paralyzed in fear, never letting my kids out of my sight, hoarding weapons, buying a cabin in the woods and living in seclusion. That, however, is not the life I am called to. Rather, I am called to trust God, to be a light in a fallen world, to point others to Jesus Christ who is the Way, the Truth and the Life. Without Him, we have no hope. Without Him, I am just another scared Mommy. In each scenario, imagined and real, I must rely on God. I turn to God, because only in Him and through Him can I maintain my sanity as a Mom. Parenting is hard and our fears are real. God can provide us with a peace beyond understanding. As Christmas approaches next week, may you know the salvation that is found in Jesus. The baby in the manger whose birth we celebrate because of His death and resurrection. So I will continue to fill my home and car with Christmas music. A reminder of the hope that I have: Jesus! Below is one of the Christmas songs I have been enjoying listening to that reminds me of the love God has demonstrated through the birth of Christ! Merry Christmas! This has truly been a week that has rocked the nation. Thank you for sharing your thoughts. Your welcome! It's hard to stay silent in the face of such tragedy.